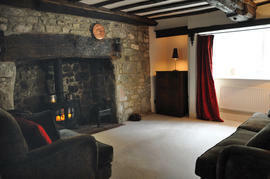 A home for all seasons... in winter, curl up cosily in front of the woodburning stove surrounded by sumptuously rich fabrics... in summer, soak up the long, light-filled days from the hillside garden, perched above the tiled and thatched roofs of Shaftesbury whilst taking in the views over miles and miles of glorious English countryside. 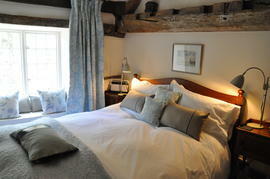 Retire to bedrooms adorned with crisp, white, Egyptian cotton bed linen piled high with luxurious cushions. The cottage sleeps 6 in 4 beautifully decorated and furnished bedrooms, complemented by an ensuite shower room, a bathroom and a wet room. Situated near the top of historic, cobbled Gold Hill, C16th Grade ll listed Updown Cottage abounds with beams and the character which can only come with the passing of over four hundred years. 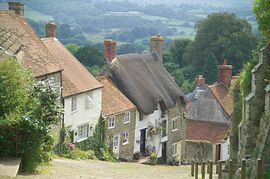 The old Saxon hilltop town of Shaftesbury stands on a 700 foot spur above Blackmore Vale in Dorset near the south coast of England. Its history dates back to the times of Alfred the Great who founded the Abbey in the 9th century, the old walls of which form part of Gold Hill. Stroll 2 minutes up the hill to find an eclectic selection of stylish shops, delicatessens, restaurants, galleries and museums. Personal chef, massage therapist and cleaning services may be arranged. 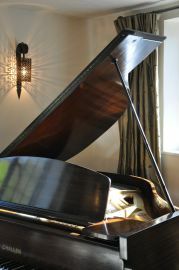 Baby grand piano, free Wifi & national landline calls. Terraced hillside garden with table and chairs and arbour seating with spectacular views over miles of countryside. Giant Jenga. 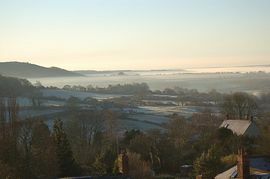 Shaftesbury is easily accessible by road, national coaches to the top of Gold Hill, Shaftesbury or rail to Gillingham only 4 miles away. Please contact us for details of season dates. Available all year for weekly bookings (Friday - Friday) and short breaks (Monday - Friday or Friday - Monday). "a real spirit of generosity" "the best holiday cottage we have stayed in" "inspiring" "...to stay in such an icon" "Jane is the friendliest, most helpful and most professional host I have ever encountered"
"almost too perfect - they've thought of everything" Sally Shalam The Guardian 4th Aug 2007. Featured in Sunday Times Britain's Best Cottages March 2008.